A little blogger love to the very talented and sweet Linda over at Surroundings for the Honest Scrap award she gave me. Since I already went on and on about myself HERE- I'll talk about Linda for a second. Linda is an interior designer here in the Boston area as well as 1/3 of The Skirted Roundtable, not to mention her 100's of other things she is a part of in the design world. This is one busy woman- go see what I mean here. If you don't already read her blog you are missing out on all her fun kitchen renovations. She is blogging the step by step process to turn her dated kitchen into a custom masterpiece. Thank you Linda for including me in such a great group of bloggers! While we are on the subject of talented bloggers, can we talk about Jamie from i suwannee for a second? Love her blog, love her style, love her new store Furbish Studio! I wish I lived in the North Carolina area because she has having a grand opening celebration that is sure to be a grand time. She has posted pics of her store transformation along the way and I can not, for the life of me, get this armoire out of my head- I AM OBSESSED! Go give these two ladies some love today! Linds! So exciting! Congrats on your award! And I love those two blogs! That piece is sooo gorgeous. Her store is looking so HOT. I too wish I lived in that area....Even the pillows tucked inside and the lamp are pretty!!! 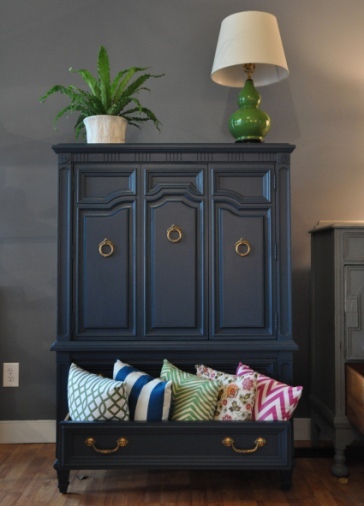 Yes, that armoire is pretty fab. I love that gray with the green, and then all those pillows!! It does look amazing! And I need to go check on Linda's kitchen progress - haven't made it over there in a while... shame on me! I saved off the image of the armoire because I love it to. I don't know if it's the shade of gray or the fab pillows, but I want it all. Linds - thanks so much for the kind words. Loved hearing more about you - fbombs and all!